Just like using it on a call, broadcasting with your headset provides more clarity and less noise. Using your Apple earphones or any compatible headset will work with the Mixlr iOS app. Simply connect your headset and use it like normal - Mixlr will automatically use the headset microphone instead of the built-in microphone. You can broadcast audio directly from a mixer, electric guitar or pretty much anything you want via the serial (iPhone 3GS/4/4S) or lightning port (iPhone 5+ and recent iPads). 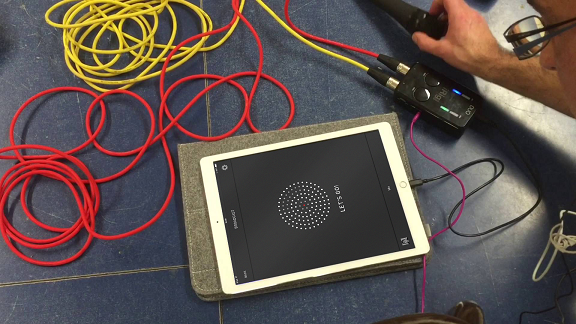 You can broadcast high-quality stereo line-level audio from the app with this method. These are the same ports you use for charging your phone and will require an adaptor such as a mobile audio interface for your device. For more advice on professional audio equipment for iOS see this article. TIP - if you are less experienced with professional audio on iOS we recommend you start with something like the iRig from IK Multimedia - it’s perfect if you want to broadcast an instrument or external microphone. This is one of the easiest ways to get high-quality audio into your iOS device. When it comes to USB microphones you have a couple of options. You can either use a ‘plug-n-play’ iOS compatible microphone or a standard USB microphone with a powered USB hub. Plug-n-play iOS mics will plug directly into the lightning port on your iOS device (iPhone 5+ and recent iPads only). Some great examples are the Rode NT-USB and the Apogee MiC 96k. With standard USB microphones you will need a powered USB hub and a lightning to USB adaptor. You can find out more about how to set this up here. You can also broadcast a line-in feed with a cable that can take an audio input at one end, and has a male 3.5mm TRRS jack at the other, such as the one linked here. This will allow you to take audio from your guitar, mixer or another source and plug this directly into the headphone socket of your device. TIP - though using a line-in (TRRS) adaptor is a quick way to get audio into your iPhone or iPad, it won’t deliver the best quality. We recommend using the serial/lightning port.